Costa Rica brought out a flurry of emotions. At times I was thrilled beyond belief, and at times I was terrified. The fear struck when I stood on a platform wearing the safety equipment for ziplining through the rainforest canopy in the Bribri area. I nearly burst into tears when the guide asked “lista?” No, I wasn’t ready. He told me I was fine and sent me on my way. As I zipped down the cable, I struggled with the instruction to use my back hand to guide myself down the line and steady myself. I would panic for a moment and grip the cable too tightly. I made it through the first three lines, when we reached a platform that was especially high. The guide told us this was a faster run. As I descended, my hand hit leaves on a tree, and I nearly turned. I panicked and gripped the cable tighter. I kept zipping down the line until I started to turn again, so again I gripped the cable. I slowed down dramatically, stopping short of the end of the line. Great, I thought. I turned myself around and started to pull myself toward the platform. I quickly realized the next zipliner had started coming toward me. He braked to avoid colliding with me, and then we both pulled ourselves toward the platform. The guide became impatient and came to get me. From this point on, I could not do it on my own. I completed the remaining lines (with the exception of a short easy one) with the guide. Even that was terrifying to me. At one platform, the trees started spinning and I grabbed onto the safety straps for dear life. Needless to say, ziplining is not for me. I did it to challenge myself while making my husband happy — he loves high-adrenaline activities. I’m glad I did a canopy tour, but I doubt I’ll ever do it again. Have you ever done anything you’re afraid of on a vacation? Tell me about it! Our canopy tour departed from Puerto Viejo. 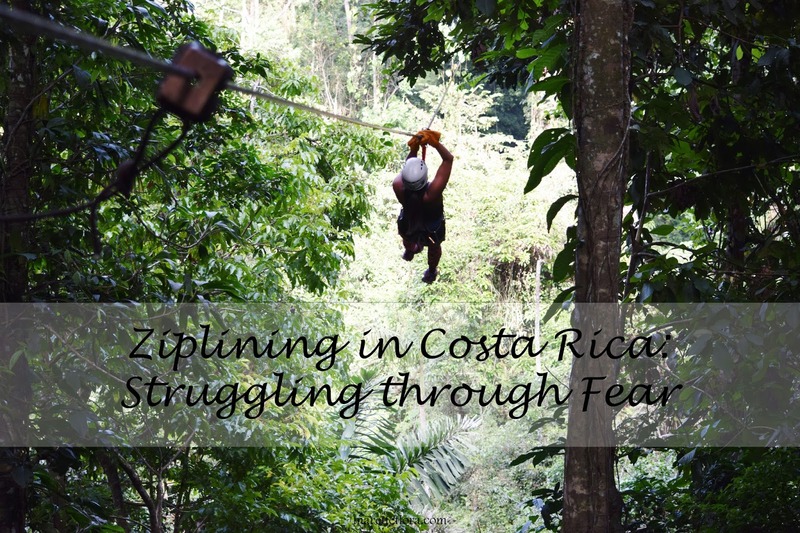 Of course, ziplining tours are available in other parts of Costa Rica as well. Our tour was through Terraventuras and cost $55 a person. The Superman cable (last line) costs an extra $10. There’s also a free Tarzan swing option. You are picked up from your hotel and driven to the office, where you sign a waiver and pay (if you haven’t already). From there, the van takes you to an unpaved road, where you get out and board the back of a truck with a roll cage on it. This truck drives you up a mountain. At the mountain office, you are outfitted with your safety gear and given instructions. (The entire tour is supposed to be four hours but ours was four and a half.) And then you’re on your way!